The bagua diagram is an essential feng shui tool used in determining the areas in your home or office that directly correlates to your nine major life areas. The bagua is divided into eight compass directions with eight trigrams. These wedges are known as guas. A ninth gua is found in the center section of the eight guas. Each of the nine areas corresponds to one of the nine major areas in life. There are several types of baguas, but the two most used are the Early Heaven Sequence Bagua and the Later Heaven Sequence Bagua. There are two different sequences of the trigrams placed around these two bagua maps. Derived from the I-Ching, known as the Book of Change, trigrams are placed in the wedges of the bagua to symbolize the universe and the changes that take place within it. The Early Heaven Sequence is known as the Primordial Arrangement or the Fu Xi (first Chinese emperor). The Later Heaven Sequence is known as the Inner World Arrangement, the Manifested Bagua or the King Wen (ruler at time). The Early Heaven arrangement of the trigrams refers to the order of the things in the universe before creation or any changes took place. It is the ideal yin bagua. 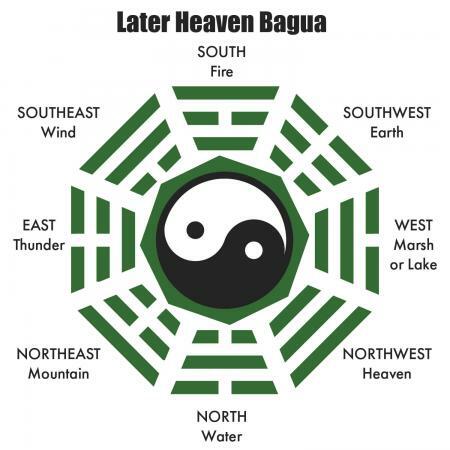 The Early Heaven Sequence Bagua was used to positioning and siting gravesites. 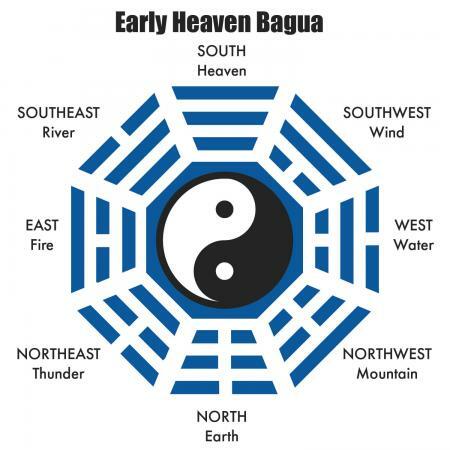 The Early Heaven Sequence Bagua is often found as bagua concave mirrors that are used in feng shui to counter poison arrows or to repel evil spirits. South: Qian means strong energy aka male (yang). North: Kun means earth or the principle of yin energy (female). Northeast: Zhen means to shake or to shock. East: Li means to leave. Southeast: Dui means cash (wealth). The Later Heaven Sequence refers to the world after the heaven and earth mated and produced all the changes that took place. These changes include everything that exists in the world. This is creation and is yang energy driven. The Later Heaven Sequence is used to site homes and businesses. The bagua used today took time to evolve and originally came from the magic square known as the Lo Shu (or Loshu). This bagua was dubbed the Later Heaven Sequence since it represents the manifestation of the bagua for earthly applications. This manifestation is the cycling of birth, death, rebirth. It replicates the cycle of the day turning into night turning back into day. 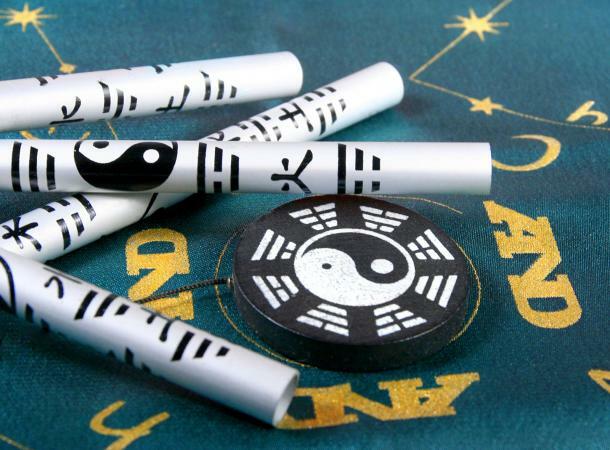 From this bagua came the creation of the Chinese calendar, time dimension feng shui, geomancy, astrology and much more. It was the result of the Earth and Heaven coming together to create the world - all life. This bagua is the practical application of the Early Heaven Sequence within the reality of an imperfect world. The Later Heaven Sequence bagua represents this union between heaven and earth and their six offspring personified as sons and daughters. Each gua was imbued with one of these genders and placed in birthing order. In this bagua, it is easy to see the beginning of the five elements theory and a few of these early element assignments to compass directions. Kun (Earth) is in the southwest sector. This represents the mother (yin). This energy is receptive. Qian (Heaven) is in the northwest sector. This represents the father (yang). This is the energy of creation. Li (Fire) is now in the south sector. It represents the middle daughter. Dui is in the West sector and represents the youngest daughter. K'an (water) is now placed in the North sector and represents the middle son. Gen (mountain) is in the Northeast sector and represents the youngest son. Zhen (thunder) is found in the East sector and represents the eldest son. Sun (wind) is placed in the Southeast sector and represents the eldest daughter. The Bagua Map is used in Black Hat Sect Feng shui. To use the bagua map, it is necessary to have a basic sketch of the floor plan of your home or office. Follow these bagua map instructions to apply this map to your home layout with the application of Black Hat Sect rules. You can use the Later Heaven Sequence bagua gender assignment to compass directions when tackling problems family dynamics. For example, if the eldest daughter is having difficulties or there is discord between her and the family, then you would first analyze the southeast sector. This is the sector that is assigned to the eldest daughter. You want to ascertain if there is an imbalance or some affliction. When you discover what is creating the imbalance in a sector, you can correct it by using feng shui principles and applications to balance the chi energy in this area. In the example of the southeast sector, keep in mind that it also governs wealth, so any corrections in this area will also remedy any afflictions affecting the wealth sector. This double governance of compass sectors over life sector and child or parent is a good barometer for how well any cures or remedies have been applied. You should notice an auspicious change in either one or both. Once you understand which bagua you need to use, you can begin improving your life. The bagua diagram is a valuable feng shui tool that can be used in the evaluation and adjustment of sectors in your home or office to improve various areas of your life.